That's it from us for tonight. We are closing early due to unforseen circumstances. Don't worry we'll be back at 6am tomorrow morning. Do join us then. The FTSE 100 ended 0.5% lower and the FTSE 250 gave up 0.8%. An estimated 7,000 jobs could relocate to Europe from the UK "in the near future", according to consultancy EY which has been tracking job moves since the referendum. It amounts to £1tn of assets - up from £800m in the last quarter. The jobs are high paid and will hit the UK tax base. "The nature of the roles that are shifting, often moving for regulatory reasons, are at the very top of the salary spectrum," EY said, calculating that the loss to the exchequer from employment taxes would be £600m. Omar Ali, UK financial services leader at EY," said: "As the 29 March draws nearer, companies are reconfirming or revising the statements they have made about the extent of staff and operational changes they are making, but we are not seeing many last-minute surprises - firms are executing their plans as expected.". "The value of assets is creeping up, the number of jobs moving is relatively stable as a total, but we are seeing individual firms reduce the number of staff they are moving, whilst still ensuring they are in a position to serve their end customers". Last week the chief executive of Volkswagen apologised for evoking a Nazi slogan to describe the importance of boosting the group's profits. Herbert Diess used the line "Ebit macht frei" - which echoes the maxim "Arbeit Macht Frei" - meaning "work sets you free", which was emblazoned in wrought-iron on the gates of the Auschwitz concentration camp. The Financial Times is reporting that shareholders are raising questions about his future. Another says they will demand an apology at the annual meeting but questions whether it merits his departure. Shares in stock-market listed restaurant group Tasty - it has 52 Wildwood pizza, pasta and grill outlets, and six dim t Asian-style restaurants - have fallen sharply after it published full year results. It reported a pre-tax loss of £11.8m verses a £9.4m loss a year a earlier. Keith Lassman, chairman said: "As highlighted previously, the market conditions for 2018 continued to remain extremely challenging. In addition, unfavourable weather conditions and the World Cup impacted 2018 performance. The exceptionally cold and snowy winter suppressed sales. "During the World Cup and an unusually hot summer, customers favoured wet-led establishments and outside seating. Trading over the Christmas period was positive, though the uncertainty of Brexit has meant that 2019 has started slowly." Shares are down more than 17%. The EU's market regulator, the European Securities and Markets Authority, announced last night that some big UK shares will have to be traded by European banks and insurance companies in the EU if there a no-deal Brexit. The companies involved included Vodafone, Rio Tinto, BP and Shell. But the City regulator, the Financial Conduct Authority, said: "This has the potential to cause disruption to market participants and issuers of shares based in both the UK and the EU, in terms of access to liquidity and could result in detriment for client best execution". "We therefore urge further dialogue on this issue in order to minimise risks of disruption in the interests of orderly markets." Co-founder of Superdry, Julian Dunkerton (pictured), wants to return to the company's board. A shareholder vote is being held on 2 April but one of the agencies, ISS, which advise big investors how to vote, has said his efforts should not be supported. Along with co-founder James Holder, he has issued a stock exchange announcement in response, insisting that together they know how to fix the issues the retailer faces. "Naturally we are disappointed by the ISS recommendation. However, we acknowledge that it is extremely rare for ISS to support shareholders who propose changes in corporate strategies. The strategic and leadership failings at Superdry remain clear and the financial and operational impacts are obvious and profound: we know how to fix these issues. We continue to engage productively with shareholders, and we are hugely encouraged by the positive response to our proposals". Superdry has rejected the business plan they have put forward - Supercharging Superdry. It is also being reported that shareholder advisory body Pirc has also recommended voting against. Why hasn't Inmarsat risen more? Earlier we mentioned that satellite firm Inmarsat had received a takeover approach. The shares have risen 16% to 510p - but below the potential offer price which is around 543p. Why? Helal Miah, investment research analyst at The Share Centre, says it is not a definite offer, the company has fended off takeover approaches in the past and the offer was made before the full year results which were "fairly encouraging". “Therefore we believe once again Inmarsat may argue to remain independent and not recommend this offer to shareholders which we believe explains why the shares [are] not trading closer to the takeover price". Back to the CBI survey mentioned earlier. Tom Crotty, director of INEOS and Chair of the CBI Manufacturing Council, said: “Manufacturers are in despair at the unacceptable failure of politicians to end the Brexit impasse. Every day that goes by without a resolution results in more businesses putting off investment and stockpiling goods in order to soften the blow from a potentially disastrous 'no deal' Brexit scenario". A week ago the government announced that most imports into the UK would not attract a tariff in the event of a no-deal Brexit. Given that the money from tariffs is treated as tax revenue, what would be the effect on the Exchequer, Treasury officials were asked earlier today? How much money would it lose? "It’s hard to know... in the sense of predicting the sort of short run impact of those tariffs with any certainty is quite difficult. This is fairly... unprecedented territory so putting a number on that will be quite a challenge." Back to the house price data out earlier. “No one was expecting fireworks after New Year while the clock runs down on Brexit but things appear to be coming to a head rather earlier than we had initially expected. "It’s no surprise slowing house price growth is swayed in a large part by downward trending prices in London and the South East. The trial of Carlos Ghosn, the former boss of Nissan, is expected to start in September. according to Japan's public broadcaster. He was released after 108 days in jail in March after being charged with financial misconduct and aggravated breach of trust, but denies wrongdoing. His lawyer apologised for disguising his client in a workman's outfit when he left detention. Wall Street is waiting for the announcement from the US Federal Reserve on interest rates due later. The S&P 500 was little changed at 2,831.34. The Nasdaq Composite was off just 1.99 points at 7,721.95 at the opening bell. The Dow Jones was off 19.59 points, or 0.08 percent, at 25,867. Here's the chart showing the pound's move against the dollar as Theresa May was speaking about asking for the extension to the UK's departure from the EU. Theresa May has written to European Council President Donald Tusk to formally request a short, one-off delay to Brexit beyond 29 March. The prime minister told MPs she was "not prepared to delay Brexit any further than the 30 June". There's a story on her remarks to MPs here. India's Jet Airways has grounded flights and delayed payments to banks, employees, suppliers and aircraft lessors. Today, the head of State Bank of India's said lenders were trying avoid bankruptcy. "We believe that it is in everybody's interest that Jet Airways continues to fly," Rajnish Kumar said. The pound has slipped down through $1.32 amid the on-going uncertainty surrounding Brexit. Theresa May has asked Brussels for a shorter than expected delay to the UK's exit from the EU. 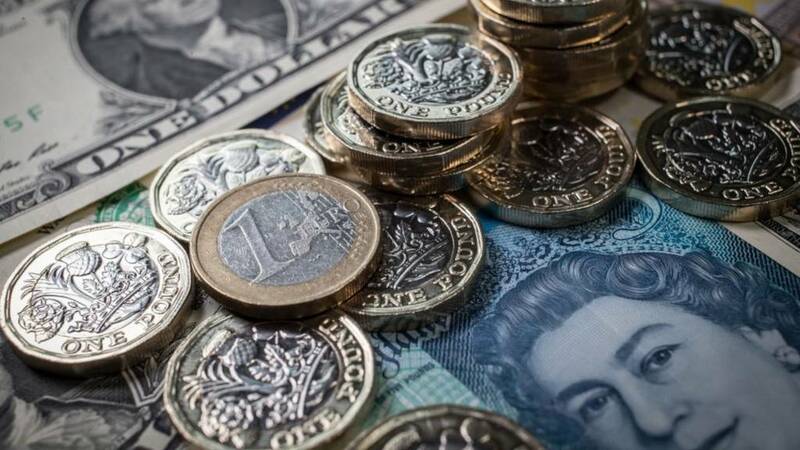 At point the pound was 0.8% down against the dollar at $1.3147. This from Russ Mould, investment director, at AJ Bell. “Within the FedEx Express business (just over half of total sales) international priority sales fell 10.3% year-on-year and international air freight by 18.3%. “If this trend persists it may not be good news for either the global economy or financial markets. “From an economic perspective, it is possible that America’s existing tariff programme, and the threat of further import taxes, are dampening global trade flows, at a time when China’s economy seems to be slowing and Europe’s floundering and the sugar rush created by the Trump tax cuts of late-2017 seems to be losing its impact." The pound is heading towards $1.32 as Theresa May asks the EU to delay the UK's departure. The pound is down 0.5% against the euro at €1.1630.